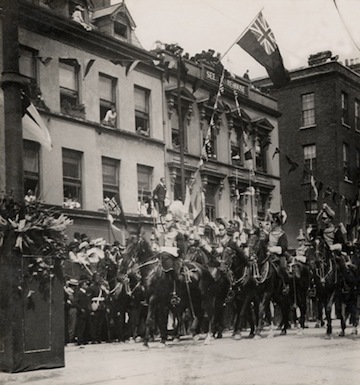 In 1903, King Edward VII visited Cork city and was greeted with acclaim. He was accompanied by his wife, Queen Alexandra, and other members of the royal household. 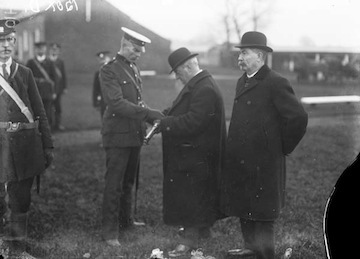 At the city’s racecourse, Cork Park, he presented new colours to two regiments. As he proceeded through the streets of Cork on his way to the presentation, the King received a warm welcome along the streets. There was some protest, but nothing on the scale of the welcome. The visit of the King placed the city of Cork firmly within the ambit of the United Kingdom and the British Empire. Beyond the symbolism of the visit, however, the ground had already begun to shift beneath the union. Successive extensions of the electoral franchise during the nineteenth century had entirely undermined the hold which unionists had once had on elections to the British parliament. The passage of old unionist Cork (see the Fitzgerald Arnotts of Castlemartyr) is documented in the novels of Somerville and Ross which are set around the turn of the twentieth century. Somerville and Ross were the pen names of Edith Somerville and Violet Martin who lived at Castlehaven. Their most famous stories are those of the Irish RM (or resident magistrate) which were made into a TV series in the 1980s. Somerville, in addition to being an author, was also a noted artist. The last conservative unionist seat was won in Cork city in a by-election in 1876. Thereafter nationalist numbers asserted themselves, including Charles Stewart Parnell who sat as MP for Cork between 1880 and 1890. 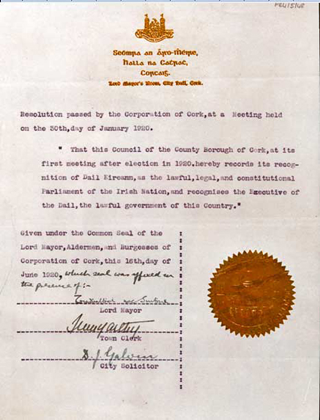 Parnell was also President of the Chamber of Commerce (founded in 1819) between 1881 and 1890, though this led to a split in the organisation and the establishment of the Cork Incorporated Chamber of Commerce and Shipping in 1883. The organisations merged finally in 1951. 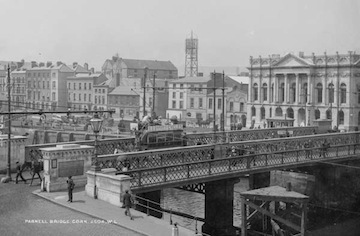 In honour of the ‘Uncrowned King’: Officially opened on 18 November 1882 by the Daniel J. Galvin, Mayor of Cork, the Parnell Bridge replaced an earlier bridge called Anglesea Bridge. This photograph was taken in the early 20th century. Among the significant institutions in Cork were workhouses in Blackrock in Cork city and in Midleton. There was also a lunatic asylum at Shanakiel, an industrial school in Baltimore and St. Patrick’s Hospital in Cork city. On the evening the census was taken, there were 5,408 persons in workhouses, and 2,457 people were recorded in hospitals. William O'Brien (1852–1928), Irish politician, journalist, social revolutionary. This photograph was taken in 1917. By 1911 the nine members of parliament representing the people of Cork in the House of Commons in London were all nationalist. Cork city was represented by two MPs, while there were also MPs representing Cork North, North-East, Mid, East, West, South and South-East. It would be wrong to imagine that because these seats were nationalist, this brought a uniformity of sorts. It didn’t. While the great national cleavage in Irish politics was between nationalist and unionist, Cork in the first decade of the twentieth century was the source of considerable tension between nationalist factions. There was an enduring split in Cork between the William O’Brien-led ‘All for Ireland League’ which had been established in 1909 and the Irish Parliamentary Party, led by John Redmond. 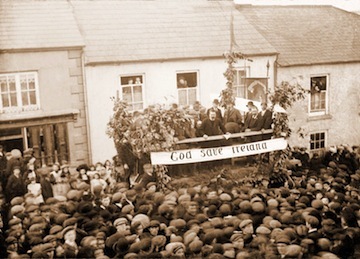 The source of the split was differing attitudes to the 1903 Land Act and equally to the process of cooperation between unionists and nationalists, promoted by O’Brien as ‘conference, conciliation and consent’. O’Brien’s belief was that cooperation between nationalists and unionists on practical issues would undermine the differences between them. The split between the O’Brienites and the Redmondites was a particularly bitter one. In one famous incident from May 1910 three Johns – Redmond, Dillon and Devlin – travelled to Cork to address a crowd. More than 20,000 of their supporters travelled to support them. The rally descended into bouts of stone-throwing as their opponents sought unsuccessfully to break up the meeting. One of O’Brien’s key supporters in Cork was Daniel D. Sheehan of Knockrea, journalist, law student and member of parliament. Sheehan’s family was evicted from their home when he was a boy and this had a profound impact on his career. He fought all his life for the cause of small farmers and landless labourers. He sought to make common ground with unionists and, during the Great War, he fought in France before being invalided out. Two of his sons were killed in the war and one of his daughters was also disabled while serving as a nurse on the front. During his political career Sheehan had tapped into the labour tradition in Cork, not a particularly potent one. Efforts to organise among the unskilled general labour force were at first confined to the Cork Labourers’ Society and the Cork Workingmen’s Association, and later to the South of Ireland Labour Union and Michael Davitt’s Labour Federation. Nonetheless what organisation there was tended to be spasmodic and localised, though the 1890s saw the recruiting efforts of the large British-based unions arrive. By 1900 unionisation was strong among the skilled workforce, though it remained poorly organised among the urban poor and virtually non-existent in rural areas. In 1898 labour candidates won 7 of the 56 seats on the Corporation. 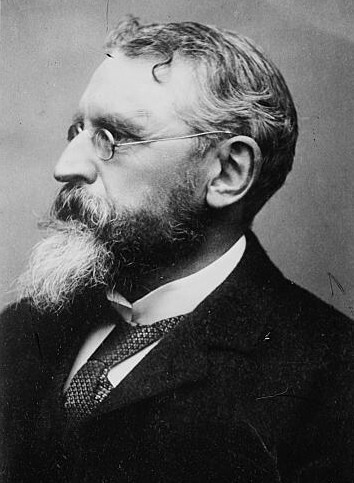 Sheehan was succeeded as MP for Cork Mid at the 1918 General Election by Terence MacSwiney. MacSwiney was one of a new generation of Cork rebels who were involved in the Irish volunteersand then in the IRA. Already in 1911 MacSwiney was contributing articles to the republican newspaper Irish Freedom. An IRA man who was later elected Lord Mayor of Cork, he died in Brixton prison in October 1920 following 74 days of hunger strike. Another Cork man who was also elected an MP, and later a TD, was Liam de Róiste of St. Bridget St., Cork city, who fought in the 1916 Rising. De Róiste had previously joined with Terence MacSwiney and others to found the Celtic Literary Society in 1903. After the 1916 Rising many Corkmen were deported to Britain. These included William, Robert and John Hales. The most famous of this generation of Cork rebels was, of course, Michael Collins, who had been born in West Cork, but had moved to London where he was introduced to the Irish Republican Brotherhood by another Corkman, Sam Maguire from Dunmanway. Maguire’s Protestant family still farmed where he had been brought up. 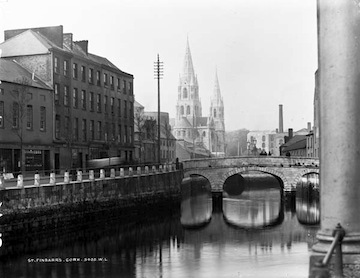 A monument to Protestant Cork: the spectacular St. Finbarr’s cathedral in Cork city rises above the River Lee. 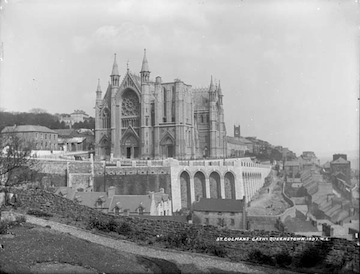 The original medieval Cathedral was demolished in 1865 and this replacement was built on the same site. The towers and spires were completed by 1879. As elsewhere in the country outside the north-eastern corner, Roman Catholics dominated the religious allegiance tables in the census. Between them Roman Catholics made up 91.5% of the population and Protestants accounted for 7.3%. The figures for Cork city though were slightly different at 88.5% Catholic and 8.6% Protestant. By the time the next census was taken in 1926, the Protestant population had dropped by half. There was also a small Presbyterian presence in Cork (see Presbyterian minister Victor Cotter at Queenstown. The spectacular St. Colman’s Cathedral in Queenstown. Work on the Cathedral began in the late 19th century, but the final phase of the construction commenced in 1911. Over 90% of the population of Cork in that year were Roman Catholic. Literacy rates in Cork were high, with 90.8% of people in the city able to read and write, while in the surrounding county the rate was 88.9%. These figures showed considerable progress over a twenty year period since 1891 even though the manner in which the figures were calculated had been altered. Educational institutions flourished in Cork. (see Rushbrook Sisters of Mercy college in Queenstown). Members of the Convent of Mercy in Skibbereen ca. 1900. Catherine McCauley had founded the Sisters of Mercy in 1831 in Dublin to care for the poor and the sick and to educate poor children. By 1837 the sisters established a house in Cork. 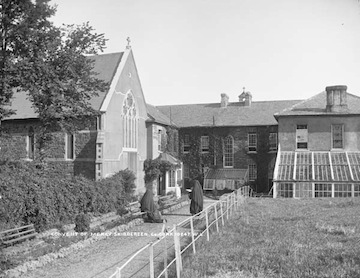 Nuns from the order first came to Skibbereen in 1860 when four sisters from Kinsale opened a school in the town. They remained in Skibbereen until July 2003. Also in Queenstown there was the Presentation College which had been established in 1889, and the Technical School which opened in 1905. In Cork city, the Technical Institution was opened in 1912 by Alderman Simcox, the merchant and lord mayor. Risteard de Hondeberg was professor of Irish at University College Cork, which had struggled to establish itself in the second half of the nineteenth century but was, by 1911, increasing in stature, not least because of the work of the president, Bertram Windle. 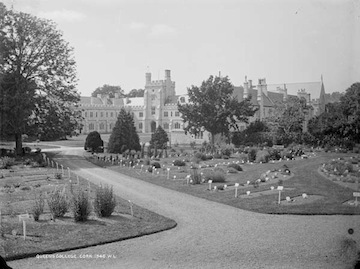 A view of buildings and grounds of Queen’s College, Cork ca. 1900. The Act establishing Queen’s College Cork (QCC) was passed in July 1845, but this was overridden by the Irish Universities Act of 1908, after which the Queen’s college was known as University College Cork. Attempts to promote Irish through the education system brought the opening of Coláiste Chairbre in 1910. This brought boarders to the area through summer months. 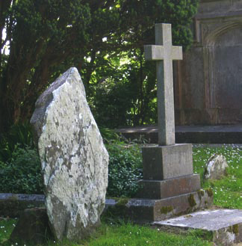 Among the key promoters of Irish in Cork was the Gaelic League activist and Irish teacher, Peadar Ó hAnnracháin. Some 83,898 people recorded themselves as being Irish-speaking (see Diarmaid O Ceocháin and family at Cahergal). This amounted to 21.4% of the population. Of these, 558 people reported an ability to speak only Irish. 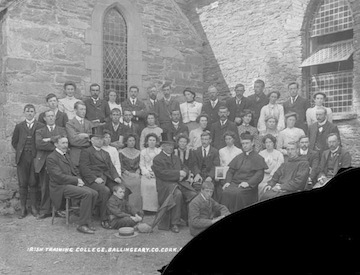 An Irish training college group pictured at Ballingeary ca. 1900. In 1911, more than one-fifth of the population of Cork declared themselves to be Irish speaking.